How much is Richard Gasquet Worth? Richard Gasquet Net Worth: Richard Gasquet is a French tennis player who has a net worth of $8 million dollars. 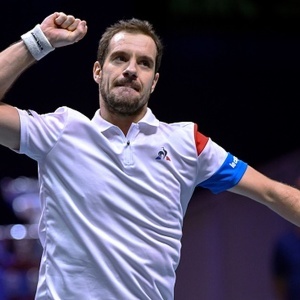 Born in Beziers, France, in 1986, Richard Gasquet took up tennis as a toddler and graced the cover on "French Tennis" magazine before his tenth birthday. Despite his age, Gasquet was considered one of the most promising French tennis prospects. He climbed to number one in the world as a junior singles player before making his professional debut in 2002. He quickly became the youngest player to ever qualify for a Tennis Masters tournament and followed that up by becoming the youngest to ever win a match since the late '80s. He appeared in his first Grand Slam tournament in 2002 at the French Open, and finished the year in the ATP's top 200 players. As a singles player, Gasquet has amassed a 367-219 record as of 2014 with ten titles; his best world ranking was seventh in 2007. As of mid-2014, Gasquet was rated the 14th best player in the world. His best Grand Slam finish came at the semifinals of Wimbledon in 2007 and the US Open in 2013. As a mixed doubles player, he claimed the 2004 French Open championship with partner Tatiana Golovin. Gasquet appeared in the 2012 Olympics as a doubles player, winning a bronze medal.